Got an AIR Virtual Instrument? Did you know you can get AIR’s Instrument Expansion Pack 3 Complete Upgrade for only $69!? 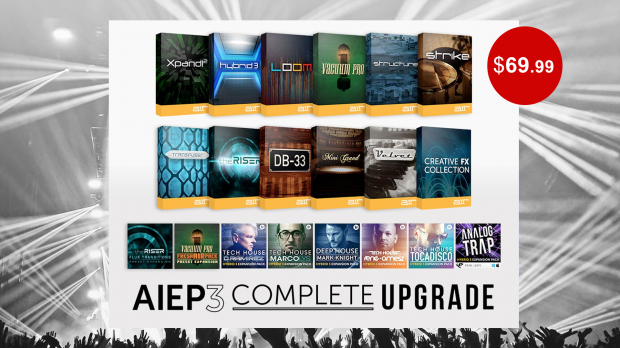 Get the AIEP 3 Complete Upgrade for only $69 ! If you love using your Xpand2, DB-33, or any AIR Virtual Instrument, then will be very happy to know you qualify for you an upgrade to the AIR Instrument Expansion Pack 3 Complete. It is a massive collection of twenty virtual instruments and progressive sound-design tools. AIR Music Tech have made this promo a ‘no-brainer’ by slashing the upgrade price by 50%. Take a look at what all you get for $69… Click on the product names below to see more about each one. This entry was posted in DontCrack, Promotions, Sounds, Virtual Instruments and tagged AIEP 3 Complete Upgrade, AIR Instrument Expansion Pack 3 Complete Upgrade, AIR Music Tech, DB-33, Hybrid 3.0, Loom, Mini Grand, Strike, Structure, The Riser, Transfuser, Vacuum Pro. Bookmark the permalink.